We arrived in Poston (Colorado River Relocation Center) in May of 1942. Everyone was told that the air temperature would rise above 115 deg. F. in the summer. The water system was not fully functional and the canals to bring water for agriculture was in the process of construction. Many decided that a cellar would be cooler than the black tarpaper barracks. The soil was soft and dusty which required the cellar walls to be reenforced. Only a few inmates could gather enough material to make a cellar deeper than three to four feet. The other cooling option was to make or buy a swamp cooler but that required materials or money for a home swamp cooler and a supply of cooling water. Our barrack (Block 38 Barack 2) was composed of the Kakuda, Aoyama, and Yamamoto families. We decided to dig cellars until water became available. We dug 3 to 4 foot pits under our barracks and used the 18 inch gap between the ground and the barrack to crawl in and out of the cellar. I remember taking naps in our and the nursery school cellars during the heat of the day. The ground was so dusty that when you crawled in or out the cellar or when the wind blew you were covered in dust. When the heat of the day became bareable we would slip on our home made getas (elevated wooden shoes) and hoppi coats (Japanese light weight robe) and go to the shower room to cool off in the showers and wash off the dirt. So many people were digging cellars that the piles of dirt from the cellar construction became a problem. It was decided to make a large dirt pile near the camp front gate. The pile became so large that to me, a child of 3 year, that it became a huge mountain. To beautify the mountain it was turned into a Japanese garden. The garden was later used by many as a place to take photos. As water became more available, the inmates began to make the equivalent of swamp coolers by passing air though a wet material using an electric fan. This moisted air would cool the barracks by evaporation unless we were in the monsoon season where the atmosphere was already moisted. Then the swamp coolers were ineffective. I remember jostling with my siblings for a breath of the cool moisten air. The swamp coolers required a constant stream of water so the inmates added water pipes to the barrack faucets. The pipe that fed the damp material had holes spaced to evenly wet the material. You can see the water stain on the barrack walls in the photos below. Poston was lucky because we had the Colorado River as a water supply. Water wells drawing water from the river supplied the water needs for swamp coolers, trees, and gardens. Our sister camp at Hila River initially had swamp coolers but they were removed because of Hila River's water shortage. When my father was set to Idaho as a farm labor he earned enough money to buy a mail order swamp cooler. It was more that a month salary if he worked in the camp. As a cook in the camp he earned only $16 per month. In Idaho he earned more than $160 per month. 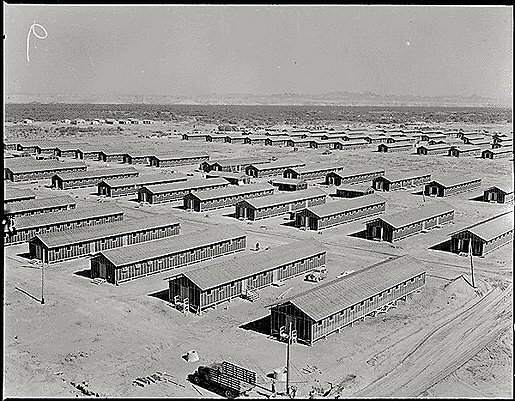 Because my father earned a living salary out side of the camp when he came back to the Poston he refused to work in the camp for $16 per month so he had to pay a fee to live in the camp he was not permitted to leave. Instead, he and his neighbors landscaped our yards by builting koi ponds, planting trees, and creating cooling pathways. Poston was still stiffing hot in the summer, a dust storm in the wind, and freezeing cold in the winter but it became more of a home. RoyKakuda — Última actualización Jul 18 2018 12:15 p.m.